Writing teachers have inevitably felt pressured to change from the forces we have listed above. But more important, teachers, and in particular those who have contributed to this book, have felt the world of writing shifting under them and have wanted to account for this change in their teaching. 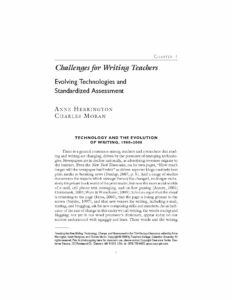 These teachers are embracing technology in their teaching, to support not only the learning of traditional essay texts but also new electronic text types—what Colin Lankshear and Michele Knobel (2006) call “post-typographic forms of texts” (p. 23). These new electronic texts—a Web site with words and images, blogs where multiple readers and writers contribute—challenge our basic notion of written texts as linear, verbal, single-authored texts. At the same time that new forms of writing—and thus literacy—are emerging in our culture and in our classrooms, forces of assessment and standardization exert a counter-pressure, asking us to prepare students to produce conventional, formulaic print texts in scripted ways. Paradoxically, technology is also being harnessed for these purposes by educational publishers and testing companies, taking the form of machine-scoring and responding to student writing. So it is that technology seems to be leading us forward to new forms of writing, but, as used by standardized testing programs, backward to the five-paragraph theme.